Mother’s Day will be here before you know it — May 9, to be exact. I’ve got the perfect gift for you to give away at church, or for that special mother in your own life. 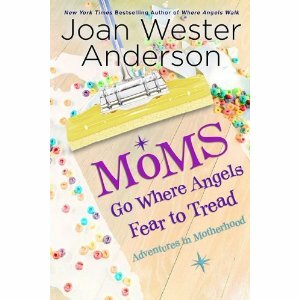 My author friend, Joan Wester Anderson, has written a delightful little book about the joys and challenges of motherhood, Moms Go Where Angels Fear to Tread: Adventures in Motherhood. Joan has written over a dozen books about angels, which is how I got to know her. Earlier this year, I preached a series of sermons on angels, and Joan’s books are just chock full of great, true angel stories. But her book, Moms Go Where Angels Fear To Tread, reflects her own real life experiences as a mother and wife. These funny short stories, and there are 40 of them, cover everything from having a sick husband (men revert to less than children when sick), to taking a class in how to get organized (it didn’t help), to things she wished she’d never said (there’s a list for her husband and kids, too). Mostly, Joan communicates the joys, minor irritations, and major rewards of being a mom. The mothers, grandmothers, daughters, and even a dad or two in your congregation will get a laugh out of these everyday stories filled with warmth, good humor, and grace. Guideposts is the publisher, and you still have time to order one (or a carton) to give away this Mother’s Day. You can find out more about Joan Wester Anderson at her website, joanwanderson.com, or friend her on Facebook. Happy reading this Mother’s Day!